Suppose a user visits your online store for the first time and looks for inspiration. All he knows is that he wants to buy something, but not exactly what yet. He clicks on one of the categories in the menu and ends up in one of the product lists. Will he find relevant products there? Unfortunately, the answer in most cases is no. The result: users leave your shop without completing the purchase. A Usability Study by the Baymard Institute on 19 internationally leading e-commerce websites showed that 67 to 90% of the users of e-commerce companies with a mediocre product list usability leave. In contrast, only 17 to 33% of the users of e-commerce companies with optimized product lists jumped off, although they were supposed to search for the same products. This reflects a four-digit number of lost leads for the shop operators! The authors also describe that many sites take a fundamentally flawed "one size fits all" approach. This makes it considerably more difficult for the user to find relevant products. These findings correspond to our own experiences. Our internal data shows that 70% of all users use product lists. But only 35% find a product there that is relevant to them. This corresponds to a 50% error rate. The probability of a purchase via a product list is therefore similar to a coin toss for many merchants. In order to stand up to the strong competition, every corner of the online shop is optimized: Product descriptions, product images, their names and alt tags, internal links, landing pages, etc. But unfortunately the product lists with their "shopping window" character are often neglected. As we have seen, there is a great deal of unexploited potential in this area. Unfortunately, many online retailers are still lagging far behind this trend. They often present the same product lists to all their visitors. 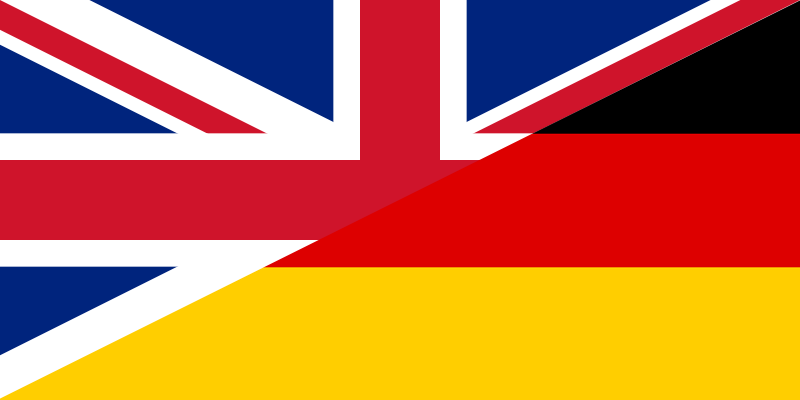 These are usually sorted according to the top sellers for all customers in the respective country. Some retailers also place products with a higher margin (e.g. private labels) at the top of their product lists. In the worst case, however, these are less relevant from the user's point of view than branded articles with a lower retail margin. Many inspiration-seeking visitors therefore quickly leave the shop again and, in the worst case, continue browsing in a competitors online shop. The problem: Until now, shop operators had no way of displaying individualized product lists for both unknown users and long-standing regular customers. With situationalization you can solve this problem automatically. Thanks to a disruptive basic technology, the ODOSCOPE platform is able to execute all processes from analysis to display of product lists within 20 milliseconds. Situational tracking data from the data warehouse serves as the basis for displaying individually relevant content. Features such as referrer, channel, device, browser or anonymous location of the visitor have a high influence on the visitor's shopping behavior. For example, you can display the most relevant products to an Android user from New York directly in the first place, without needing personal data from him or her. The user interactions with the content are taken into account in the subsequent analyses. This results in a feedback loop that is constantly optimized. 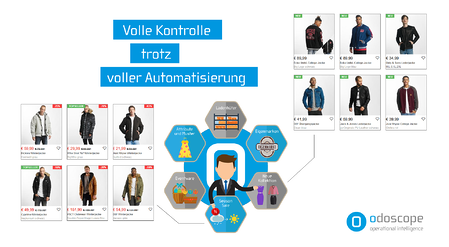 As in individualized shelves, you show each visitor the most relevant products in the product lists - adapted in real time to their current shopping situation. Even unknown users are thus addressed optimally. 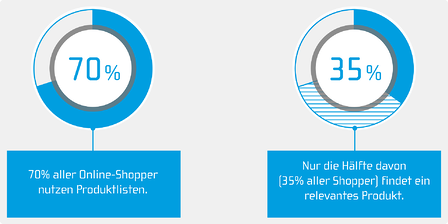 Situational data for the individualization of your online shop is sufficient for the system. The same product list in different situations contains different products. 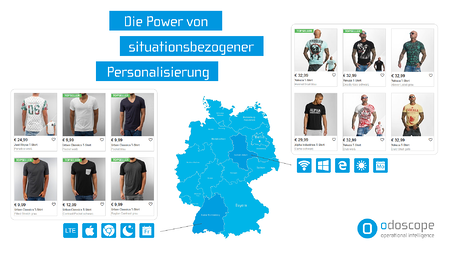 With situationalization you show every user the exactly fitting products. In contrast to conventional, manual product list maintenance, ODOSCOPE works fully automatized. This way, online retailers save considerable effort and reduce their costs for maintaining product lists. This allows shop managers and product owners to focus on strategic issues instead of reordering products or coordinating these activities several hours a week. Nevertheless, you retain full control over the online shop. The ODOSCOPE Dashboard gives you a permanent insight into all optimization measures. The company's own business logic can also be easily integrated. With just a few clicks, your goals are weighted higher in the individual rearrangement of the product lists (e.g. boosting your own brands or increasing conversions). Highest performance values and shop visitors who stay, buy more and come back confirm this approach. The result: an increase in revenue of 20% and more through more relevant content. Boost certain attributes such as sale products or new collections. These then flow into the optimization of the digital touchpoints with a higher weighting. But apart from situational data, the ODOSCOPE platform is also able to use other data sources for optimization. This can be data from your CRM, ERP or PIM. This means that information about the customer's purchase history, stock levels or product return rates can be incorporated into the optimization of content. Also personal data of the customers can be integrated. Many e-commerce companies also work with personas of their users. Personas are idealized groups of people to whom certain characteristics or concrete patterns of use are ascribed. In this way, the marketing or product team should focus more strongly on the concrete user needs. With the help of the ODOSCOPE platform, these personas, which have been developed over a long period of time, can add to the situationalization of content and products on an individual company basis. This means that our technology can be tailored even more precisely to the needs of your users and regular customers. However, the integration of other data sources and personas is as different from company to company as the tools and interfaces used. Please feel free to contact us, so we can analyze your individual requirements and increase the success of your online shop together. We are already working successfully with many companies. For example with our customer DefShop. In our case study you will learn how DefShop uses ODOSCOPE to increase its sales and reduce its costs at the same time.